LANDA Arquitectos has completed Pabellón M in Monterrey. 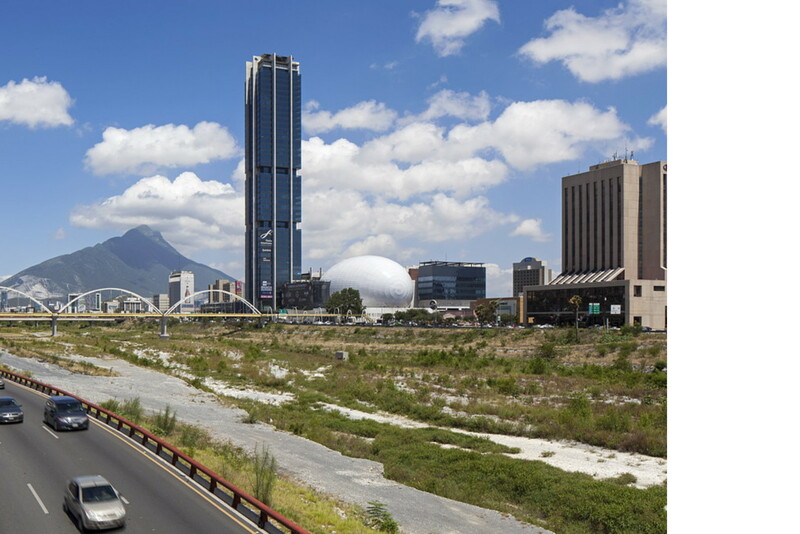 The city of Monterrey now has a new public centre with a 52 storey concrete and glass tower. The ceramic tiled floors in Pabellón M feature special materials made by Iris Ceramica Fabbrica Marmi e Graniti and Ariostea and distributed by Versitalia, the local branch of the Italian group. Pabellón M in Monterrey, the industrial capital of Mexico, restores to the people a public space to the south of the city which had been abandoned and neglected in recent years. The project was begun by architect Agustín Landa Vértiz, head of the Mexican studio LANDA Arquitectos, and when he died in 2015 it was completed by his son Agustín Landa Ruiloba, who has inherited his spirit and architectural poetics, and by architect Rolando Martinez Rodriguez. The photographs reveal the imposing structure of Pabellón M as it is today: conceived as a new icon on the urban scene, it is inspired by modern Mexico’s concrete, glass and steel architecture on the outside, while on the inside it contains majestic spaces underlined by a glossy black floor in a bold contemporary style, made of tiles by the Italian company IrisFMG, distributed exclusively by Versitalia in Latin America. The project has gone through some surprising ups and downs, and been changed several times; in its final form, it includes a 52 storey tower 206 metres high, an auditorium with 4500 seats and 6 floors of commercial and office space, including the offices of the city of Monterrey, a six-level parking lot, a heliport and a bridge connecting it with a big department store on the other side of Avenida Juarez. Agustín Landa Ruiloba says that he realised right away that as the development was to combine offices with commercial space, not all of which had been specifically assigned, , the project required a layout divided into separate parts which could be broken off from the whole without sacrificing its sense of unity. The first version incorporated two towers and a central pavilion, to which a hotel, a number of restaurants, a gym, a coffee shop and a couple of cinemas were later added. Today the layout includes a single glass tower at the southwest corner of the site, towering over a modular square concrete complex containing an oval-shaped auditorium inspired by Renzo Piano’s auditorium in the Parco della Musica in Rome. Between the auditorium and the tower is a large foyer forming the courtyard, the covered “piazza” that is the building’s heart. Its importance is underlined by a mirror ceiling reflecting a glossy black ceramic floor, a special product for large floors made by the Italian company IrisFMG under the name Tundra Grey. LANDA wanted all the public parts of the complex to be covered with glossy black slabs to create an unusual reflective effect that would make the foyer seem even bigger, triggering that sense of wonder that Agustín Landa Ruiloba saw as one of the purposes of architecture. The same effect is applied to the concrete structure in the central hall, creating the impression that it continues beyond its walls. The special flooring material designed by IrisFMG could be made in the large quantities required by such a vast project, while ensuring the lightness and resistance to wear required for use in a public space and needing very little maintenance. The commercial and service areas in Pabellón M may be accessed directly from Corso Garibaldi or from Corso Melchor Ocampo, while the auditorium has a public entrance on Avenida Costitution, the road marking the southern boundary of central Monterrey. The Rio Santa Caterina flows here, with Pabellón M and its 52 storey glass tower standing on its banks, high above the rest of the city. Agustín Landa Ruiloba ensures the building’s continuity with the history of the country’s industrial architecture: ““The use of concrete, glass, steel and clay bricks relates this project to the industrial origins and history of Monterrey and its enterprises like Cervecería Cuauhtemoc, Fundidora Monterrey, Cigarrera La Moderna, and Vitro, among others”. But its role today is that of a public, commercial and cultural centre, a sort of covered plaza set up for commerce, events and performances. People are once again coming back to a place that once symbolised public life in the city, Mercado Colón, to get together and enjoy life in the city. Agustín Landa Ruiloba says that the owner of the building, engineer Salomón Marcuschamer, wanted to give the city back some of the good luck and value it had given him, who came to Monterrey as a child with his father and managed to build his wealth over the years. It is not just a landmark, but, in the client’s intentions, a trigger for redevelopment of the area which has inspired the construction of other tall buildings and led to renovation of the roads and green areas by the city government.